TV Archives - Touch Display Research, Inc.
August 21, 2017 by Jennifer Colegrove Ph.D., Principal Analyst, Touch Display Research Inc.
Quantum dot (including quantum rod, or tetrapod-shaped quantum dot) could improve picture quality of displays dramatically in terms of color gamut, color accuracy and reducing power consumption compared to conventional Liquid Crystal Display (LCD)/ Light Emitting Diode (LED) displays. This is one of the biggest breakthrough technologies for display in several years. Quantum dot LCD is challenging AMOLED displays. QD Vision and Sony brought quantum dot TVs to the market in 2013. Nanosys, 3M and Amazon brought quantum dot tablet PCs to the market in 2013. Samsung announced the first Cadmium-free quantum dot TV at CES 2015, and has been commercializing it since Q1 2015. LG Electronics also announced quantum dot TV at CES 2015, (but later LG changed strategy about quantum dot). Quantum dot was a hot topic at CES 2015 to 2017, at SID DisplayWeek from 2013 to 2017, and at IFA 2014 to 2017. According to the “Quantum Dot Display and Lighting Technologies and Market Forecast 2017 Report”, the quantum dot display has grown from zero dollar revenue in 2012 to a billion-dollar display category in 2017. The quantum dot display formed a new category—QLED (Quantum dot based Light Emitting Diode). The definition of QLED has not yet been defined within the display industry. In the early years, “QLED”, or “QDEL”, or “QD-LED” were used in academic papers to call the electro-luminescent (EL) types of quantum dot. When an electric current is applied to these types of material, it will generate light. At this moment in 2017, the EL types of quantum dot are still in the R&D stage. Currently, 100% the quantum dot display that is commercially available is the photo-luminescent (PL) type quantum dot. When a short wavelength light (such as blue light) shines on a certain quantum dot, then it can emit a longer wavelength light (such as green or red). In 2016, Samsung Electronics has applied for the trademark “Samsung QLED TV” with the US Patent and Trademark Office. Samsung indicated that although they own the “Samsung QLED TV” trade mark, the “QLED” name is a common term like OLED TV or LED TV. “QLED” can be used by the whole display industry as a category name to call any displays with quantum dots in it. Touch Display Research believes it is a good idea to use QLED as an umbrella name (or category name) to call any displays with quantum dots in it. Under the QLED umbrella name, the photo-luminescent (PL) type quantum dot can be called QLED PL type. The electro-luminescent (EL) types of quantum dot can be called QLED EL type. QLED is a nice and short name. There is no need to reserve the QLED name for the EL type quantum dot only, since EL type is not in the market yet. When the EL type quantum dot enters the market (we forecast it will be after 2019), we can call it: QLED EL type under the QLED umbrella. In April 2017, three large TV suppliers (Samsung, Hisense, TCL), a supply chain (Nanosys), and five large retailers in China (GOME Electrical Appliances, Suning Commerce Group, JD.com, Five Star and Sundan) have agreed to form the QLED TV Alliance in Beijing China. TCL has also enhanced the support of QLED by launching new QLED TVs globally since May. Touch Display Research, Inc. (www.TouchDisplayResearch.com) is a technology market research and consulting firm specializing in touch screen and emerging display technologies such as OLED displays, quantum dots, flexible displays, e-paper displays, ITO-replacement, Active pen, near-eye displays, gesture controls, voice recognition, and eye tracking. Touch Display Research helps technology companies grow and connecting their technologies to the marketplace. We have been writing about OLED industry for over 10 years. We were the first company to publish Quantum Dot market reports. We were the first company to publish Active Pen market report, and ITO-replacement market report. We have always been there to analyze new and emerging technologies. 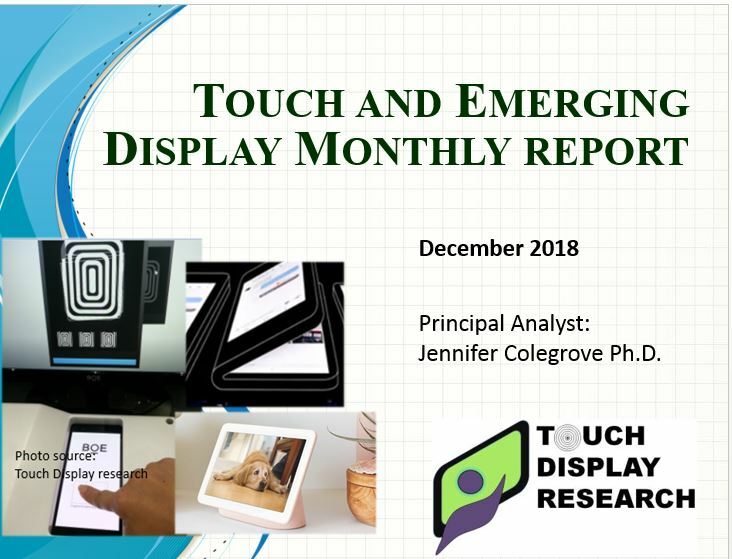 Touch Display Research provides reports, consulting, and due diligence to touch suppliers, display manufacturers, consumer electronics ODMs/OEMs, material suppliers, investors and venture capitalists. We are member of Flextech Alliance, SEMI and SID. This entry was posted in QLED, Quantum dot, TV and tagged 3M, Nanosys, QD Vision, QLED, QLED TV, quantum dot, quantum dot display, quantum dot TV, Samsung, sony on August 21, 2017 by jennycolegrove. At CES 2017, the battle between OLED display and Quantum Dot display is heating up. Samsung, TCL, Hisense are geared up of new TVs with quantum dot technologies in them. LG, Sony, Skyworth are showing more and larger OLED TVs. There also comes Nano Cell and Nano Color. Who will won this battle? Which company will benefit? Why did Samsung acquire QD Vision? What is the new form factors of quantum dot? What are the new directions of OLED? 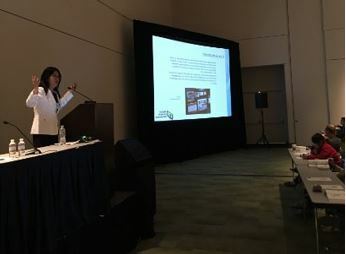 Dr. Jennifer Colegrove, CEO and Principal Analyst at Touch Display Research will give a presentation about OLED vs Quantum Dot market to 2027 at the one-day conference (Feb 3, 2017) hosted by the SID Los Angeles chapter in Costa Mesa, California, and will visit companies in the area. This entry was posted in AMOLED, Company News, Quantum dot, TV and tagged CES 2017, Hisense, LG, Nano Cell, Nano Color, OLED, quantum dot, Samsung, SID LA chapter, Skyworth, sony, TCL on January 17, 2017 by jennycolegrove. Recently, Korea media reported that Samsung confirmed that it is acquiring QD Vision. The confirmation comes from the head of Samsung’s Advanced Institute of Technology Jung Chil-hee. There is no words about the financial detail, but rumors hold Samsung will pay about $70 million. Touch Display Research believes quantum dot technology is one of the biggest breakthrough technologies for LCD in recent several years. Now quantum dot LCD is challenging AMOLED (Active Matrix Organic Light Emitting Diode). 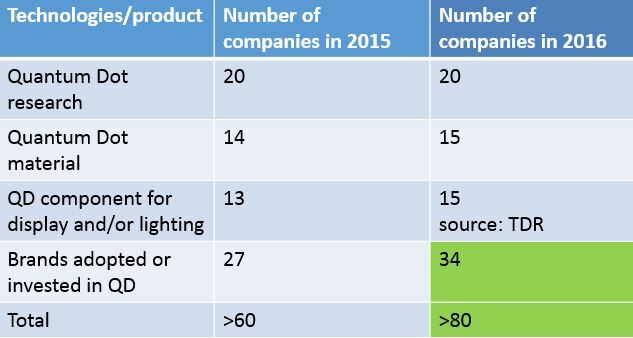 The number of companies working on quantum dot has increase from 60 in 2015 to over 80 in 2016. Touch Display Research forecasts the overall quantum dot display component and lighting and QLED (quantum light emitting diode) market will surpass $2 billion by 2017, and reach $10.8 billion by 2026. Source: Quantum dot technologies and market forecast 2016 report, Touch Display Research Inc.
More analysis can be found in the “Quantum dot 2016 report” and the “Touch and Emerging Display monthly report”. 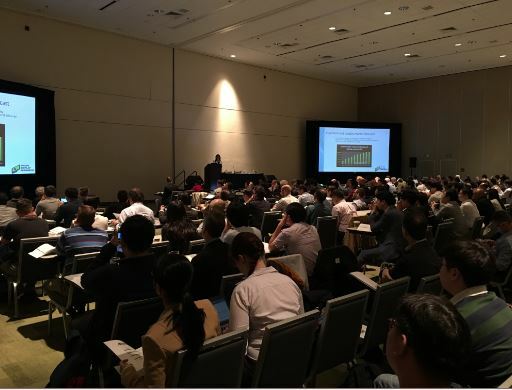 “…your presentation at Monday’s seminars was the most engaging and well presented out of all the speakers.”–an attendee of Monday Seminar at SID DisplayWeek. This entry was posted in Quantum dot, TV and tagged acquire, QD Vision, quantum dot, quantum dot display, Samsung on November 30, 2016 by jennycolegrove. As we covered before, when Samsung unveiled its SUHD TV at CES last year, Samsung called it “nano-crystal” technology. Today, Samsung clearly said “quantum dot display” in its press release. Samsung manufactured the Cadmium-free quantum dot in house, while with license from Nanosys Inc. In the “Quantum Dot Display and Lighting Technologies and Market Forecast 2015 Report” Second Edition, Touch Display Research forecasts that the quantum dot display and lighting component market will surpass $2 billion by 2016 and reach $10.6 billion by 2025. This report profiles over sixty companies working on quantum dot materials and quantum dot components. This entry was posted in Quantum dot, TV and tagged Cadmium free, CES 2016, nano crystal, Nanosys, quantum dot, quantum dot display, Quantum dot market forecast, Samsung on January 5, 2016 by jennycolegrove. LG has been demonstrating its 65” 4K OLED TV since CES 2014 and had road tour promotions since October 2014 in many cities worldwide. 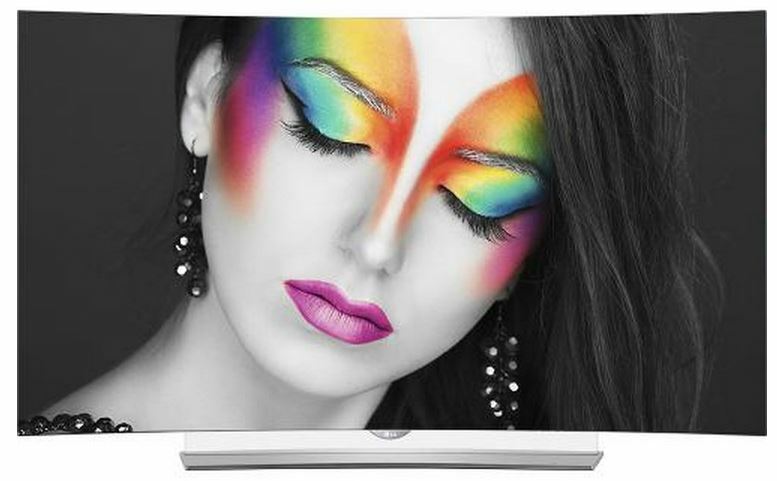 However, it is until Q1 2015, the LG 65” 4K OLED TV is available in the US market. The 65” 4K OLED TV 65EG9600 is selling for $9000 currently. Another similar model is selling for $12000 currently. LG’s website also indicated the 77” 4K OLED TV is coming soon. Now with LG’s 65” 4K OLED TV commercially available, our forecast becomes reality in 2 years. Over a year ago, in the “Touch and Emerging Display report”, June 2013 issue, page 45, we forecasted “Apple will adopt AMOLED within 18 months”. Now with the Apple Watch announced, our forecast becomes reality in 18 months. In October 2013, Samsung announced the Galaxy Round with curved AMOLED display. One month later, LG also announced the G Flex. Our forecast became reality in 9 months. Sorry about tooting our own horn, but these are the facts. We are good at OLED forecast. This entry was posted in 4K, AMOLED, Displays, Flexible curved display, OLED, smart watch, TV and tagged 4K OLED, Apple, Apple Watch, LG, market forecast, OLED, OLED TV, Samsung on April 16, 2015 by jennycolegrove. Today at the CES 2015, Samsung and Nanosys just announced they have entered into a multi-year agreement that Samsung Electronics will adopt Nanosys’s quantum dot technologies. In the news release, both companies emphasize that include the cadmium-free quantum dots. Besides Samsung’s quantum dot TV, we will also see LG’s quantum dot TV at CES 2015. LG is adopting Dow Chemical and Nanoco’s cadmium-free quantum dots. TCL will also showcase quantum dot TV at the show, which is using QD Vision’s quantum dot. 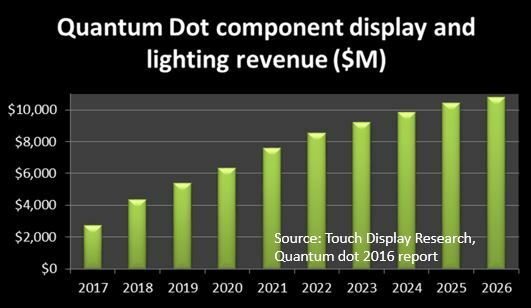 Touch Display Research forecast quantum dot will have rapid penetration into LCDs in the next several years. We’ll make sure to compare and analyze all the quantum dot devices at CES 2015, in our upcoming, 2nd edition of the “Quantum dot display and lighting technology and market forecast” 2015 report. This entry was posted in Displays, Quantum dot, TV and tagged Dow Chemical, LG, Nanoco, Nanosys, quantum dot, quantum dot display, Quantum dot market forecast, Samsung on January 5, 2015 by jennycolegrove. Today LG announced it’ll showcase its quantum dot TV at the upcoming CES 2015. We also expect Samsung to show quantum dot TV. Quantum dot could improve Liquid Crystal Display (LCD) dramatically in terms of color gamut, color accuracy and reducing power consumption. This is one of the biggest breakthrough technologies for LCD in recent several years. Now quantum dot LCD is challenging AMOLED. Touch Display Research surveyed many quantum dot suppliers and found that the quantum dot display component market surpassed $70 million in 2013. 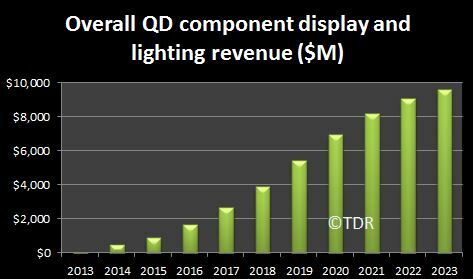 We forecast that the quantum dot display and lighting component market will reach $9.6 billion by 2023. Source: Touch Display Research “Quantum dot display and lighting technologies and market forecast report”. Touch Display Research will be at CES 2015 and report about all quantum dot displays and lighting. This entry was posted in AMOLED, Displays, Quantum dot, TV and tagged LG, quantum dot, quantum dot display, Quantum dot market forecast, Samsung on December 16, 2014 by jennycolegrove. 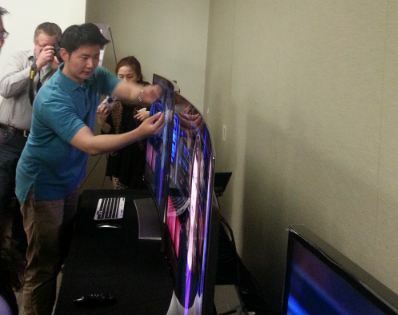 Yesterday, we were invited and attended LG Electronics’ OLED TV event in Silicon Valley, California. It’s a good event to meet with LG’s OLED TV people and networking with other analysts and media. LG demonstrated two curved 55” OLED TVs, the new 2014 model: 55EC9300, which is just become available in BestBuy stores in US this week. You can buy it now for $3499, that is only 23% of last year’s OLED TV price! LG put the curved OLED TVs side by side with two curved 55” 4K LED backlight LCD TVs from Samsung. We discussed with LG’s managers about the power consumption and the OLED TV in China market. More pictures and analysis will be found in our “Touch and Emerging Display” September 2014 report. This entry was posted in Displays, Flexible curved display, OLED, TV and tagged 4K curved, 4K OLED, compare TV, Curved OLED, LG, OLED, OLED TV, Silicon valley, TV power consumption on August 27, 2014 by jennycolegrove.